Can not thank Falasiri enough for the wonderful job they have done. Mehrdad came and make our business POP with his selections of rugs. We have an amazing runner down our hallway that helps with the noise and a beautiful rug in our waiting area. Our clients comment on them every day. Can not thank Falasiri enough for the wonderful job they have done. The expertise and professionalism at Falasiri Rugs is unparalleled in all of Florida without doubt. They have a depth of knowledge that is unique. Go to their store with time to listen to the stories about the history and culture of the rugs. It is like going back in time on a magic carpet ride :-). 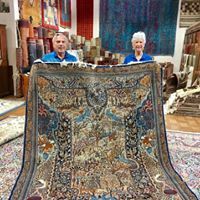 Because they deeply understand and love rugs, they give the necessary care and attention to restoration and cleaning. Excellent quality and selection. Very knowledgeable personnel. Beautiful rugs and knowledgable staff. Highly recommended.